A good friend was in town for a few days and so I decided to treat her to some lunch - vegan style! I came up with this recipe and named it after her. I'm glad to report that it went down a treat. 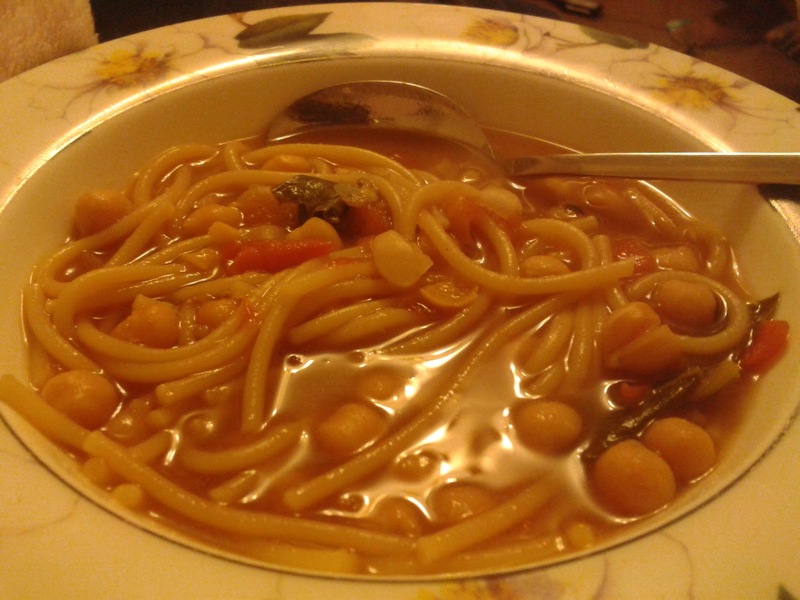 The broth is light and fragrant; the chickpeas and pasta make it filling and wholesome. I consider this recipe a bit of a fusion dish because I used some Japanese miso paste to give it a lift. I used fresh chickpeas which made the cooking time quite long. Canned chickpeas work if you're short on time. If you're using fresh chickpeas, be sure to soak them overnight. Boil them in fresh water for 2-3 hours or until soft. Start to build up the soup: add all the ingredients - except the miso paste - to a large pot and simmer on very low heat for an hour. Stir in the miso paste and bring the soup to a boil for a further 10 minutes, making sure the paste is well dissolved. *Don't fret if you don't have immediate access to miso paste, vegetable stock cubes are a good replacement.